Thirteen budding artists from across Sydenham High have had their pictures selected to feature in a unique 2013 charity calendar. The competition to create the calendar was the idea of Head Girls Anya Landolt and Asha Williams who wanted to find a way to bring the whole school together and raise money for charity at the same time. 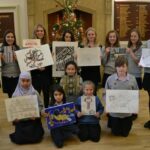 Girls could submit a painting, drawing or photograph that depicted something about the school and the range of entries was tremendous. A judging panel including the Art Department eventually whittled the entries down to 13 winning images for a front cover and 12 months. The calendars are priced at £7.50 with all the profits going to the school’s chosen 125 th anniversary cancer charities. To get your copy of this exclusive and sought-after calendar click here for an order form. All completed order forms must be returned to the school office with payment by Friday 30 November. Hurry to avoid disappointment!